I know this is a website devoted to the row house but as it’s our premier issue, I think I can stretch the rules a little bit if it’s within the scope of the topic. My apartment in New York is definitely a small living space. And we’re a family of three with pets. Join me for a little tour of our humble abode. It’s not unusual to have limited living space in New York. What matters is what you do with the space you do have. Often, your family will grow before you can upgrade to another apartment so you learn to be highly adaptable. I can’t take all the credit because I happened to have married a man who is also very good at space management. The first photo is of our living room. It’s important to note that we also have a working music studio, a full entertainment center and all of our daughter’s toys. What we sacrificed was a coffee table so that our daughter would have space to play. Having a corner computer work station is wonderful. When we were assembling it, we thought it was too big for our space but as we pushed it into the corner, it seemed to disappear. 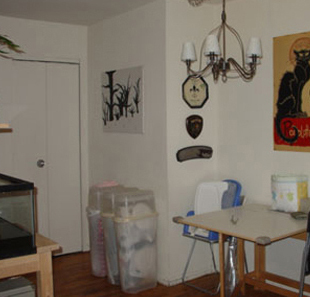 Family living in a Brooklyn Apartment, 545 square feet. The second photo is of our dining area. Nothing special here. The room is a huge “L” shape adjoined to the living area. Our building is over a hundred years old so we lucked out with the open floor plan. We kept stepping in the cat’s water dish so we bought a stand alone kitchen island sort of piece from IKEA and we use it to hold our turtle’s tank and to keep the cats’ dishes out of the way. A gate leg table is a must for any small space dining area. Next is a composite of our bedroom. When you can’t create a wall, your improvise. We got the sheeting for the curtain from Target and the hardware from IKEA. Cost of entire, apartment-friendly, project? $40.00. Having a grown-up space for the mom and dad? Priceless. Using dressers instead of night tables minimizes the footprint of bedroom furniture. 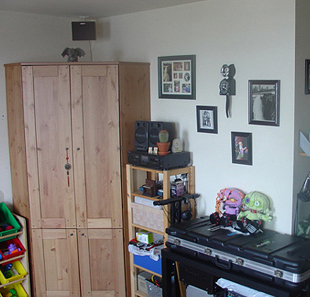 Finally, a picture of the other half of our once huge bedroom. 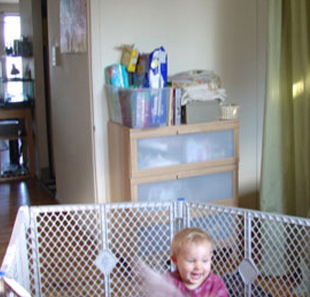 Since this photo, we’ve added a toddler bed for her without having to give up much flow. The benefit of a curtain is that you can open it for air circulation. We also benefited from the two bedroom windows allowing both sides to get fresh air. 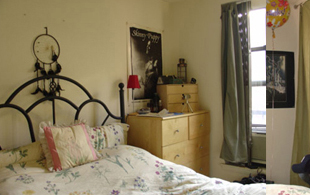 A curtain can divide a room, creating two bedrooms instead of one. Thanks for taking a little tour of our apartment. We’ve loved every minute we’ve lived there. But we’re really looking forward to moving into our new row house in Philadelphia next month!